This post is only tangentially related to LGBTQIA, but I figure it may be beneficial to any trans*men who are transitioning and haven’t gotten much experience in traditional men’s bathrooms. This last Saturday I went to Geek Girl Con. A fantastic con that promotes feminism, minorities and LGBTQIA people in geek culture. 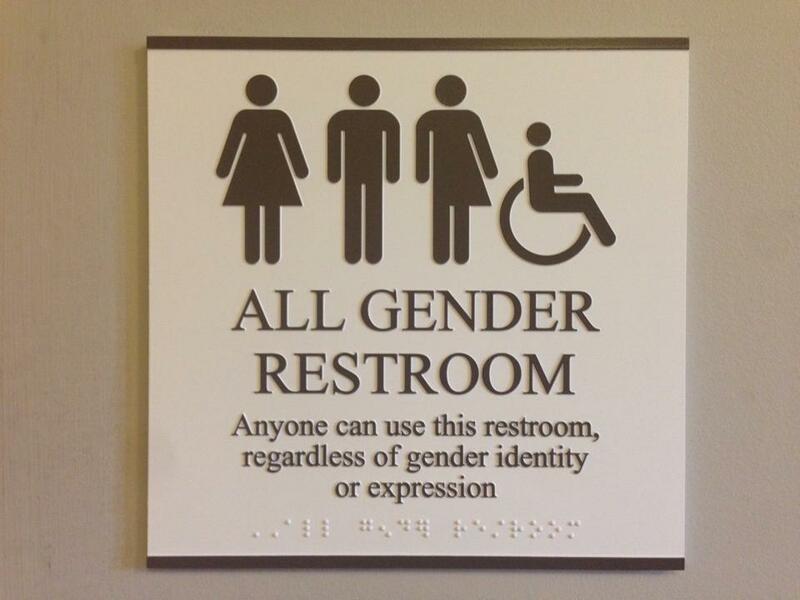 One of their trademarks is converting all the bathrooms to unisex bathrooms. This isn’t the sign, I forgot to take a photo of that. I love that unisex bathrooms are there. I don’t personally see a reason why its separate. After all, its illegal to harass someone no matter their gender anyways. It is true, I probably have some personal biases with Wolsey and bathroom bills anyways, but still that is how I have always felt. Now, there is one thing that unisex bathrooms makes very clear. People raised as men are taught different bathroom etiquette then women. I have been told by Wolsey and prior girlfriends that it is allowable to talk with each other in the ladies bathroom. I also know it is evidently a surprise to a lot of women that this is definitely considered a no-no in boys bathroom. So Saturday I walk into the unisex bathroom and there is a line for the stalls and the urinals. A couple of younger girls are talking and they start talking to me. I hesitantly respond, not because they aren’t interesting or there is an issue, but my entire training in life for men’s bathrooms was you don’t talk. They are nice people of course, and so I do start talking. 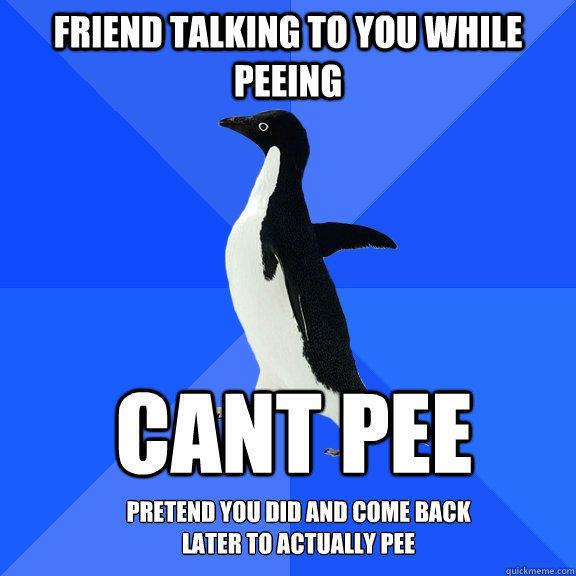 The line for the urinal was much faster so I walk over when its my turn and they are still talking to me. Just chatting away and no matter how hard I try I can’t go. They are behind me, so its not like there is any danger of them seeing, and they aren’t particularly interested in watching anyways, but they want to talk to me. I stood there for several minutes thinking in my head that its all ok, just go ahead. 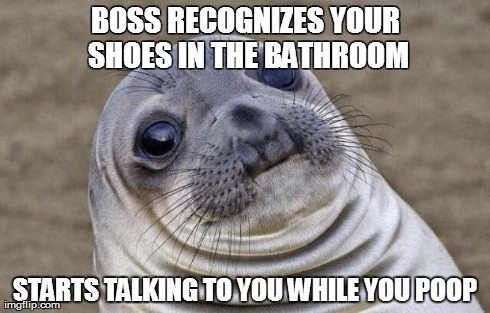 It wasn’t until the ladies who were still talking to me both went into stalls that I was able to partially do my business. I finished, said goodbye and came out to Wolsey, who erupted into laughter the second I told him about it. So key fact to all people using the men’s bathrooms for the first time (or sharing a bathroom with a man for the first time). There is a pretty explicit hard rule that we are raised with, you don’t talk to each other, especially not at a urinal. This of course only goes for public bathrooms, things change in relationships at home. I am not saying that is the best option, of course we could relearn it and maybe be more easy going about it. However, until that day happens, other people who grew up using the men’s bathroom are going to be uncomfortable with you, and they will avoid using the bathrooms with you in the future. Oh, and yes some men do talk to other men in the bathroom. I am not sure where they were when the rest of us learned the etiquette but it is sometimes awkward with other men. Also, just a side note that this goes for bathroom stalls as well, it is generally considered not polite to start chatting to someone in the other stall, which is apparently contradictory to those who use the women’s bathrooms, or so I have been told. This entry was posted in All Articles, Lucky's Articles (AG) and tagged bathroom etiquette, uncomfortable, unisex. Bookmark the permalink. I’ve found that in queer spaces it is much more common for men to talk in the bathroom. Any time there are cishetero men in the mix in a homosocial space however, there’s like too much of an air of threat and fear for anyone to feel comfortable with any engagement or interaction at all. I’d experienced the constantly assessing the fight-ability of every other man around you before I came out, but it’s like heightened to a bizarre degree in men’s bathrooms. I could see it being uncomfortable to experience after growing up with the typical men’s bathroom experience! That is very likely. I am still relatively new in the gay community and haven’t had that experience. I think your right with your assessment on the cishetero men. Oh, and I totally agree about the hand washing. So many men in our office don’t wash their hands, no matter what they did in the bathroom… blech…. You are definitely not the weird one. Even after being married to Jello for 25 years we can share the bathroom, but there is absolutely no talking when on the toilet. It is way too weird.